I started off with American Apparel T-Shirt. I used striping tape to block off triangles and filled them in with China Glaze Mistletoe Kisses. Then I went in with a white striping polish and painted the little triangles, finishing off the tree tops with star-shaped rhinestones. 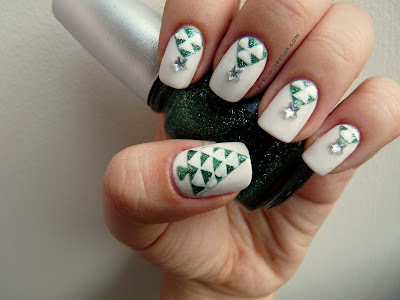 Oh wow yours is the prettiest Xmas tree nail art i've seen so far!